Walgreen Co is the nation's largest drugstore chain with fiscal 2008 sales of $59 billion. The company operates 6,902 drugstores in all 50 states, the District of Columbia and Puerto Rico. The company is member of the S&P 500 and was a recent addition to the S&P Dividend Aristocrats index. Walgreen Co has paid dividends for more than 76 years and consistently increased payments to common shareholders every year for 34 years. The company recently announced a 22.2% raise in its quarterly dividends. Between June of 1999 up until June 2009 this dividend growth stock has delivered an annual average total return of 0.70% to its shareholders. The stock is changing hands at the same levels it was trading a decade ago. The company has managed to deliver a 14.90% average annual increase in its EPS between 1999 and 2008. 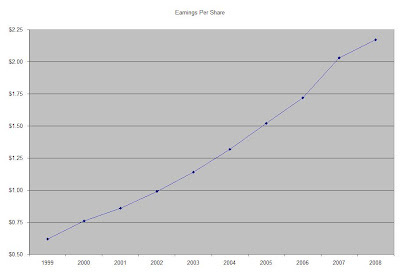 Earnings per share are expected to decrease to $2 in FY 2009, before recovering to $2.30 by FY 2010. Sales are also expected to increase from $59 billion in 2008 to $68 billion in 2010. Unlike its competitors, Walgreen seems to focus on internal growth either through opening new stores or focusing on proper location of in store merchandise, growth of products offered and making its operations more efficient. The company plans to slow down on the growth rate of opening new stores from high single digits to low single digits by 2011. The Return on Equity has slightly decreased over the past decade from 19.70% in 1999 to 18% in 2008. Rather than focus on absolute values for this indicator, I generally want to see at least a stable return on equity over time. Annual dividends have increased by an average of 13.40 % annually since 1999, which is lower than the growth in EPS. A 13 % growth in dividends translates into the dividend payment doubling every five years. If we look at historical data, going as far back as 1976, Walgreen Co has actually managed to double its dividend payment every five and a half years on average. The dividend payout ratio has ranged between 13.6% and 20.9%. A lower payout is always a plus, since it leaves room for consistent dividend growth minimizing the impact of short-term fluctuations in earnings. The low payout has enabled Walgreen to spend more on growing its business. As its markets become saturated I expect the company to increase its payout over time. Currently Walgreen Co is trading at 14.50 times earnings and yields 1.90%. While the price earnings multiple and the dividend payout are attractive, the dividend yield is below my 3% entry criteria. I would only consider initiating a position in Walgreen on dips below $18.50. If the stock drops to $25 and premiums increase I would consider selling longer dated covered puts at strikes $20 or $17.50.